…police say the pair started demanding money, something the 28-year-old said she didn’t have. That’s when one of the attackers allegedly picked up a kitchen knife, turned on the stove, and put the blade in the flame. “And then four separate times burnt the 28-year-old female, burnt her face, both of her arms and her stomach,” Small said. Still she refused to speak, so the crime went further. “Then picked up the 28-year-old’s two-year-old daughter and threatened to kill the daughter if she didn’t say where the money was,” Small said. Home invasions are one of my biggest fears when it comes to armed confrontations. I think it’s because they occur inside the most comfortable and trusted shelter we have, our homes. Where you should be able to go into condition white and turn off your vigilance and recharge your batteries. A place where you kiss your child good night shouldn’t be the place that you have to fight for your life. But alas, there are some people on this planet that don’t feel that way. In fact, the kind of predator who breaks into your home when he knows you’re there is a special kind of dangerous. Burglars are one thing. Those guys don’t necessarily want to interact with you in your home. They want to get in and out with as much loot as possible, as quickly as possible. Home invaders are scary because they know you’re home, and they still want to come in. As a result, I have taken several precautions to prepare for this. In fact, I suppose several of my posts so far have been dedicated to topics that all tie back to defending from home invaders. I mentioned in another article that I carry a gun inside my house. This article will outline the requirements I have for an ‘underwear gun’, the gun I chose for the job, its accessories, the drawstroke for T.U.G., and some of the drills I do with this gun. Jack Black and I get down like this. Mission: Choose, outfit, and always carry a pistol meant to be worn around the home. 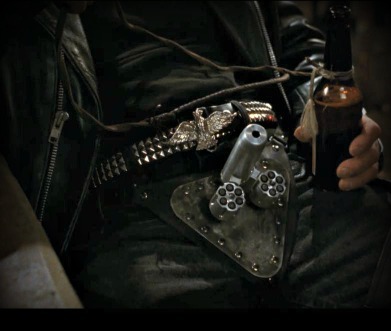 The Dusk Till Dawn crotch gun was never put on the market, so I needed another solution. The reliability requirement is obvious. I have no requirement for minimum caliber size for T.U.G., only that it be reliable when I need to use it. As an aside, don’t take my (or anyone’s) word that your gun is reliable. You have to know this for yourself. Small guns (due at least in part to the tight angles that ammo has to feed from magazine to chamber) tend to be very ammunition sensitive. Some ammo will work, others just won’t. You should run a few boxes of your chosen defensive ammo in your underwear gun before you even start to call it reliable. Small guns can even vary in reliability within the same model. It sometimes only matters what month the gun came off of the assembly line. Universal Clipdraw – Semi-Auto This is the universal clip draw. I wouldn’t use this on a Glock or any striker fired gun with a loaded chamber. 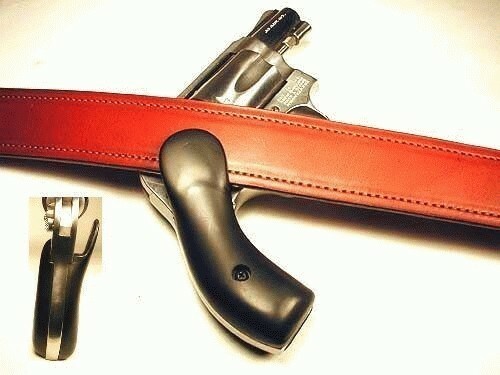 I’d only put it on double action guns, or guns with safeties. It can also be used to replace a flimsy flashlight clip with a very beefy spring steel clip. CLIPDRAW J-Frame This is the one I have on my J-frame. I’m fond of it. DeSantis Clip Grip – This is a cool set of grips that has a flare of material on the right side of the gun which can go over the belt and keeps the gun secure inside the waistband. It’s a great update to the Barami Hip Grip, which felt like greased soap and didn’t fill the hand very well. The DeSantis grips are legit, though. Techna Clip This is nearly identical to the clipdraws, but they are made for the newer generations of small framed pocket guns. This is what I have on my LCP. They also make left handed versions, which is good for those that need it. 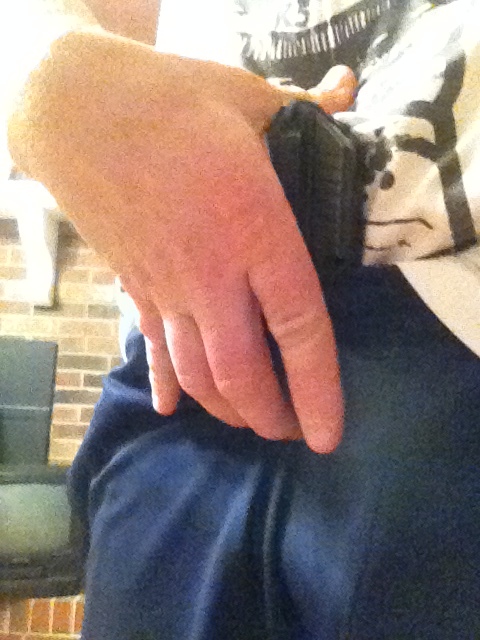 With a double action gun, and an on-board clip to keep it from falling down my pants, I’m in business. You could technically do this with any gun you wanted if you always wear a belt, but my requirements limit the size of the gun I can carry. Which brings me onto my next point. The weight and size envelope matters. I want something that I can carry in exercise shorts or sweat pants around the house. As a result, I am limited to a pocket gun (mouse gun), usually in a caliber less than or equal to 9mm. This is my favorite chart for getting an idea of what I should expect when I go to handle different pocket guns. I also satisfy the next requirement by simply looking for a DAO gun in the list. My last requirement is easy enough to meet. I had my short list of guns that I thought would work, kept an eye out on the used market, and waited for something to pop up. 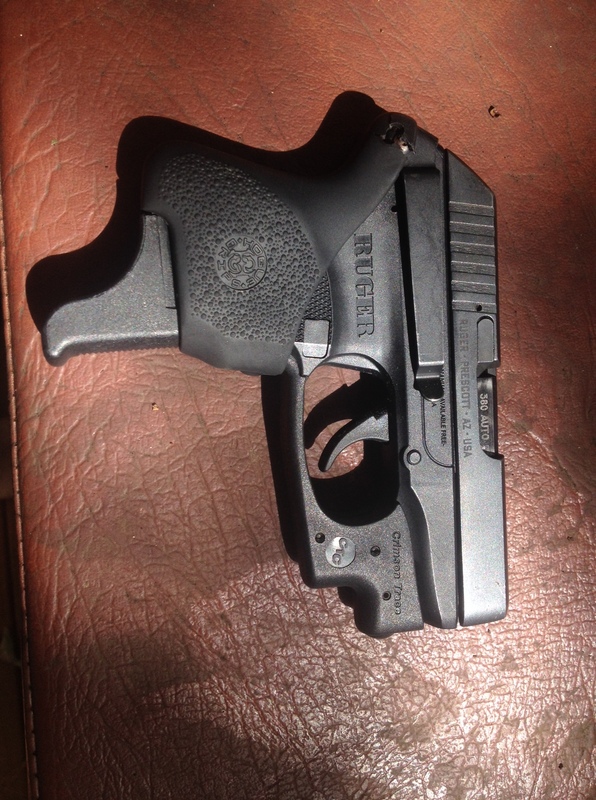 I have had a KelTec PF9 (9mm), a Smith 442 (.38spl), a Taurus PT22 (.22lr), and now a Ruger LCP (.380) to fit this role. After selling the PF9 to fund a M&P shield, and selling the Taurus to my dad as his underwear gun, I am left with the J-frame and the Ruger. Due to weight and magazine capacity, I find myself carrying the Ruger most often. Crimson Trace Laserguard – I think lasers are a great addition to any gun, especially one with sights as small and difficult to see as the LCP (gen 1). I also am fond of a laser that comes on when forming the full firing grip. It also has the benefit of allowing one to turn the laser off if one trains to relax that middle finger, as situation dictates. Lasers won’t make you control your trigger better, so you’ll still need to do the work. Hogue Handall Grip Sleeve – This makes the grip of the gun just a little bit fatter. This allows a more hand filling feel, as well as a less cramped trigger pull. 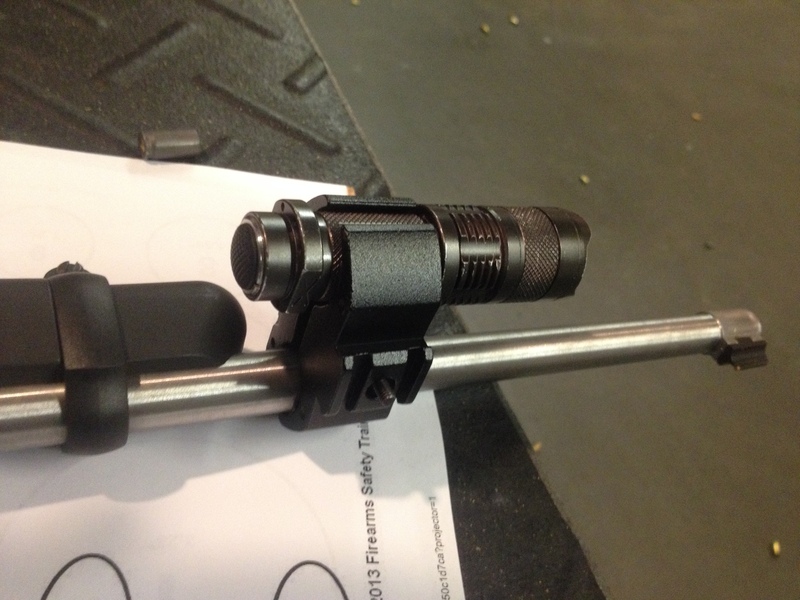 GARRISON Grip Extension – This cool mag extension allows me to get all of my fingers on the gun. 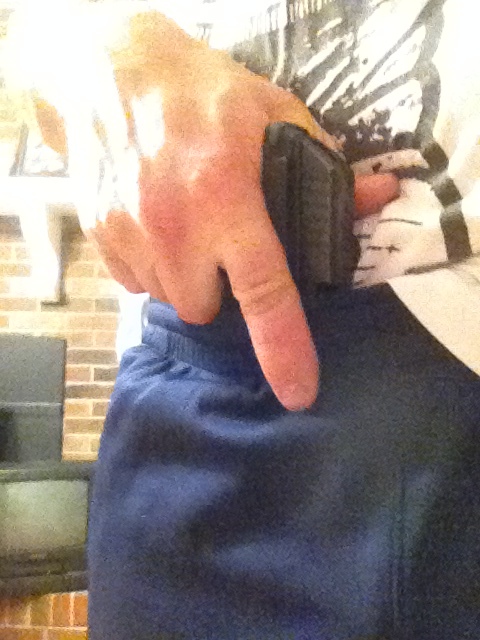 The tail of the mag extension also serves as a hook to keep the grip of the pistol right at my pants line. 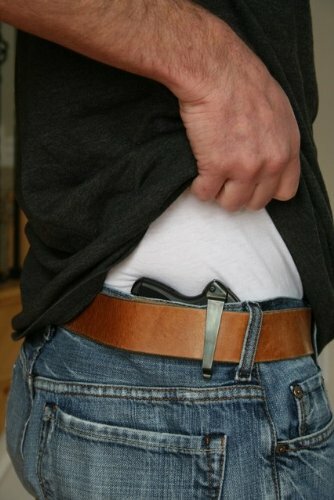 Without it, and the gun only has one point of contact at the clip, and can roll behind the pants (great for when you require the deepest concealment). Index the muzzle of the pistol through the pants with your middle and/or ring finger, and your thumb’s pad to the rear of the tang. Note: my shirt is tucked so you can see what’s happening. Really, the thumb is used to swim under the shirt material and then indexes on the tang. 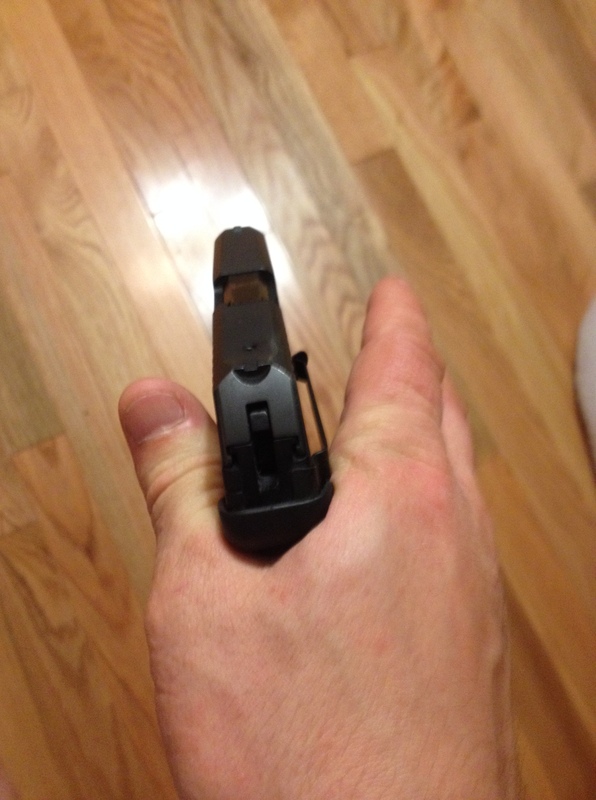 Press in and up with your middle/ring fingers and slide the pistol up as you slide your thumb behind the pistol. The photos were taken with a potato. Excuse the poor quality. Pinch the pistol between your thumb and index finger to lift it high enough to get your fingers wrapped and complete the drawstroke as normal. This is what the pinch looks like. The pinch is what lifts it high enough to form the full firing grip. This article gave me some ideas about .380 ammo selection. I had previously been using ball ammunition, because I was concerned about penetration and feed issues. I will be buying a few boxes of the top two he mentions in the article to try out. Surprise! Nothing is different here. I do what I do with all my other pistols. Dryfire and drills. In such a small package, the .380 is a snappy little beast. I’m personally good for about 50-75 rounds before El Snatcho gets me and I fatigue to the point of diminishing returns. The hogue and grip extension mitigate this a bit, but only a little. This is an argument for a KelTec P32, or a .22 in a similar sized package. The sights on the LCP are just little bumps on the slide (sights on the gen2 are much better). I routinely make hits at 15 yards into the head box of an IDPA target (sans laser), but it took work. Don’t let anyone convince you that it’s only a bad-breath distance gun. Gain competence, and you will gain confidence. The trigger, like most all tiny double action guns, isn’t great. But again, dry fire and meaningful range time will allow you to work around this. I have had T.U.G. in its current configuration for about a year. This gun gets a lot of carry and shooting time (about 30% of my range time). T.U.G. in addition to allowing me to be armed around the house, makes a great grocery run gun, dog walk gun, gym gun, jog gun, and a wonderful Non-Permissive Environment gun. I always carry as large a gun as I can, and sometimes that gun is T.U.G. May we always shoot home invaders in the face. This post is another in the theme of getting the most utility out of a very limited training time and budget. In the first article, I tried to give the general structure of how I allocate training and practice time to the different sub-disciplines I deem important for defense of my family and myself (you should pick yours based on your situation) . In this post, we will look at the most probable armed citizen encounters and then we can associate some skill building exercises and drills to help guarantee we are ‘good enough’ to handle most situations. I know a lot of people will take issue with only reaching for the “lowest rung of the ladder”, but hear me out first. I feel a person should always hold themselves to a higher standard in any discipline they choose to pursue, but to many people the next step in shooting is an unsolvable quagmire of conflicting messages from youtube, movies, gun-rag articles, and the tacticool gurus who are out of touch with the realities of the truly average gun owner. So this article could be used as the jumping point to escape “I know which end is the dangerous end” skill levels to whatever level of proficiency you choose to acquire. There seems to be a huge gap in the knowledge base and skill-set of shooters in the training community. I’m talking about the sub-set of folks between the most basic of NRA shooters and the training junkies. There is a middle ground of people who realize they need to know more, but don’t know where to start. Others in this group own a gun and mistakenly think of it as a talisman which will ward off evil by it’s mere presence (to be honest, a lot of times it does, but I won’t let you off that easy). It’s our job to recognize we are not as good as we think we are and we must have the metacognition to escape from the Dunning-Kruger effect. I’m writing this entry for all of the above groups. These people (possibly you) don’t necessarily want to be tossed into a 2 day, 1000 round shooting extravaganza. You might only want or have time for a single day of instruction. You might only have time for a single range trip every other month. We have families and strict budgets but we know that we need more than basic instruction. What, then, are the most critical skills to prevail in a defensive gun use with minimal round counts and maximal learning opportunities? You could probably imagine several shooters who could use this information. 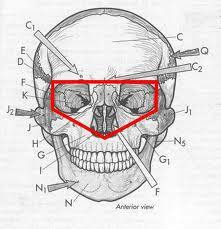 For instance, my wife, my mother, and my father all fit this profile. How can we get them ‘good enough’ to win most of the time? Mission: To find and establish a ‘most probable’ set of skills (and drills to practice) based on real armed citizen encounters. First, I’m an engineer. If you ask me how to find a formula or table, my job is to know how to find the data in a book or database and then try to apply it to the situation. I suppose I do that with this self-defense thing. We as shooters have access to huge pools of raw data in the form of articles, news clips, and also researchers who like to compile this sort of info. We would be foolish to not take advantage of these great resources. In the interest of maintaining my sanity and free time, I rely on the aggregators to do the work. I also trust in the great minds that have come ahead of me and filter their recommendations through my own experiences, situation, skill-set, and available training resources. Do the same for yourself. Here is The Tactical Professor’s page of links to different shootings you can study. Here is Reddit’s Defensive Gun Use subreddit. You can quickly scroll through and find hundreds of recent defensive gun uses, including bad shoots. Here is Guns Save Lives. With over 1200 cataloged DGUs. You can divide it by caliber, location, number of bad guys, and so on. It’s great. The majority of these incidents involved an armed robbery, which I believe is probably the most likely scenario for armed self-defense by private citizen. … the typical armed robbery occurs at anywhere from two or three steps, to roughly the length of a car — between the robber and his victim. That is, then, about three to seven yards typically, or say nine to 21′ or so. This is the distance at which most of my students have had to use their guns. I believe we should do the bulk of our training and practice at these “most likely” distances. So it would appear that our most probable shooting distance would be between 3 and 5 yards. This is if you carry a gun concealed (I hope you are, please do). If you only have a house gun, you should practice distances that range from 3 yards, up to the longest distance in your home. You have to tailor this stuff to your reality. Given the geometry of the human heart and upper lung fields, a great target size is a 5″ diameter circle. A sharpie marker and an old CD make cheap circles. Draw an aiming point in the center and you have a good target. The smaller your point of aim, the smaller your group size will tend to be. “Aim small; Miss small”, right? For the ocular cavity, a 3×5 notecard makes for a great target to simulate this area. You can draw some eyeballs on the card if you’re fancy, or just shoot at The Tactical Professor’s eyeball target. I personally think the single best shooting skill you can hone to a fine edge is the draw to a single shot. This is assuming you carry a gun everyday. If you only keep a gun unloaded in your safe, or in a nightstand, then you need to practice from this condition. Practice picking the gun off of the table, rack the slide and do your shooting. There is literally no sense wasting time and money on holsters and mag pouches if you will only ever use these things for training. The condition that you choose to keep your firearms is none of my business, or anyone else’s. But they are your business. You need to get repetitions getting your weapons into action, however you chose to keep them. After the first shot, the shooting problem gets much more complicated. Watch any CCTV video of a shooting. Once pistols start discharging, everyone starts moving faster. This makes hitting things even harder, so you might as well get really really good at that first shot. This is not to say that you should only work single shots from the holster. In fact, I think there’s a better ‘base line’ drill that requires multiple shots. Just make sure you put time in on this. If you are shooting your .22 Special Application Rifle, then you’ll want to consider starting your drill from whatever condition you keep your rifle. For example, I’m having my wife start with an empty chamber, mag in, safety on. She’s getting reps of manipulating the rifle as it rests in the closet at home as she’s getting reps of the shooting. Kill as many birds with as few stones as possible. The most important thing you can do with a gun in your hand is learn to think and make rational decisions. As a result, decisional shooting drills must be part of your practice in some way. If all you ever do is do a smoking fast draw to a headshot, well maybe that’s all you’ll ever do when it counts. The problem is, the right choice might have been to draw and hold the scumbag at gunpoint and walk him out of your house and let the cops do their job and handle him. Thinking with a gun in your hand is a necessary skill. Time is the least definable aspect of this whole thing. I will generally default to the drill designers for par times. Par times are a great way to add stress to an otherwise carefree drill. I encourage you to download a par timer for your smart phone. The timer adds a stress that is very valuable to an entry level (any level) shooter. The par times should be generous, but still provide motivation and urgency to execute the shooting cleanly and efficiently. I find that a shot timer is nice when you have access to a private range, but public indoor ranges (the norm in Atlanta) are loud and shot timers are hit or miss. What about Reloads? One Handed-Shooting? Stoppage reduction? Reloads, one hand shooting, and clearing malfunctions have a very very low chance of occurring during the already improbable chance that you’ll need to get your gun out in public. That said, I’ll throw in a drill that you can do to get a few repetitions of these things so that if you need to do it under the stress of a real DGU, you have been there before in your mind, and hopefully can make it work in the moment. I encourage you to read Claude Werner’s (The Tactical Professor) great article about the same topic: What skills should we train and practice? ; you will see Claude’s influence on my thinking when approaching this problem. I owe a lot of my current approach to firearms training to conversations we’ve had. Here’s a data table from the article. So despite how much it’s stressed in most classes, it’s very unlikely that you will need to do a reload in a gunfight. But you see that you should be practicing opening your safe quickly, or drawing to shooting. I’m legitimately open to your input for changes here. I want to cover enough drills that will use about 100-150 rounds of ammunition, take a little over an hour to shoot, and cover most of the bases that need covering. Don’t fall into the trap of just ‘training the drill’. Here’s a great article about that topic. These drills should be an audit of your skills. Or in some cases, a baseline standard for what is ‘good enough’ to allow you to get through ‘average’ gunfights or armed encounters. I really think that these drills cover the most important shooting skills that will satisfy the 80/20 rule. While these drills are a great start and the bell-curve of shootings seems to be pretty clear when looking at huge pools of data, there are outliers. It is in these rarest of rare instances that your level of proficiency and selection of tools will be the dividing line. John from Ballistic Radio just wrote about this. Ultimately, you must hold yourself to a higher standard and push to the limits that you are capable of pushing. …Statistics are cold comfort after you discover that your case is the rare exception. Thank you for reading this long post. I felt it was important and I needed to get it out. I hope you enjoyed it and got something from it. Please share it with your friends and use it to help people out of the murky depths of unconscious incompetence. Please subscribe to the blog, and shop through the G.U.G. Amazon Store click-thru to help support the blog. This will be a quick post about how I have the rifle set up. 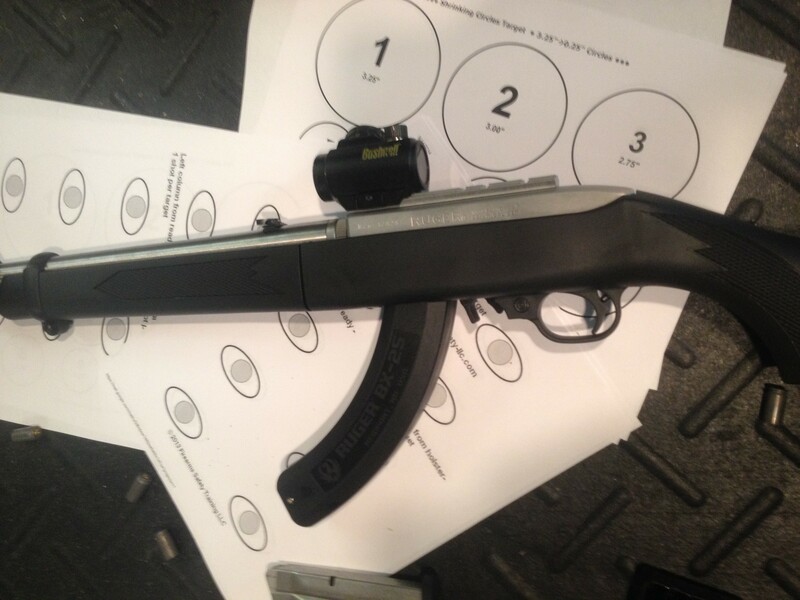 The Ruger 10/22 takedown is the base gun. It came with a drilled and tapped receiver, and a weaver mount. If you don’t have a mount, any of these rails should work. Let your budget be your guide. Don’t forget the blue locktite. 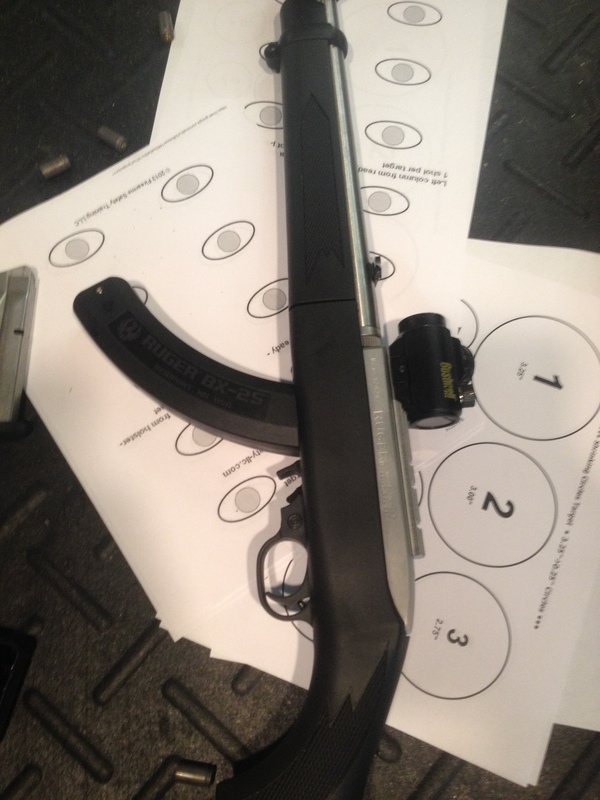 Dr. Sherman H. of Revolver Science uses a Nodak Spud rail w/ onboard peep sight. This one is cool because it creates a longer sight radius and because peep sights are the heat. This is the single most important ‘accessory’ for any firearm. In a rimfire caliber, it’s even more so. The hit and miss ignition and feeding of rimfire .22 is known far and wide as a great reason to not trust a .22 with your life. Right Reddit? So what is a guy to do? Buy better ammunition, silly. As The Tactical Professor pointed out, smallbore rifle shooters are the group to look at for ammunition. They demand a high reliability rate since failures to ignite cost time and could cost them a match. So for now, I’ve used Federal Premium HV Match ammunition. I’ve had 200 rounds go ‘pew!‘ with absolutely zero malfunctions with this ammo. Can you say that you’ve fired 200 rounds of your chosen defensive ammo through your gun? If not, then your argument against my choice is built on shaky ground. The other brand that the cognoscenti likes is CCI. You want High Velocity (for penetration) and high quality. Don’t use the 550 round bricks for bad guys. Use that stuff to practice! As an aside, in whatever firearm you use, make sure you test your chosen ammo in your gun in the magazines you intend to use with it. Why an optic? I have been trying to get my wife used to iron sights on rifles for several years. My wife is blind as a bat without glasses (we keep an old pair of glasses rubber banded to the stock of the gun), is cross eye dominant, and can’t seem to build a good shoulder and cheek weld with the rifle. I have taught many people to shoulder a rifle, and for whatever reason, it’s not in her body mechanics. Her instinct is to try to see down the sights with her left eye when the rifle is shouldered on the right. I have fought this for 5 years to no avail. It’s a training and practice issue (which is why this project was started in the first place). The Red-dot is a Bushnell TRS-25 that I had living on a shotgun that wasn’t in use. Battery life is good enough for me to leave it on a 3 setting all the time, and change the battery every 6 months or so. I mounted it as far forward as I could to keep the dot smaller and hopefully buy a bit more precision. It’s rugged enough and works well enough for me to trust it in this application. I’d love to put an Aimpoint Micro H-1 on it and change the battery once a year, but that’s not in the diaper budget. Since the optic doesn’t have a quick disconnect mount on it, I am working an ‘optic failure’ drill into my wives program. This will involve using the optic as a large ghost ring, and require her to make hits on a 10 inch circle at 5 yards. It’s a really bad day if the battery is dead and you’re using the rifle in a defense situation, but once you plan for an emergency, it ceases to be an emergency. I bought several factory Ruger BX-25 magazines from CDNN for $20 a piece. They have proven totally reliable so far, though the rifle only has about 500 rounds down the pipe. For “GO” mags, I would only use these factory mags. An interesting note, the reason they hold 25 rounds is because that’s half of the usual box of 50 rounds of .22LR (tidbit from the Doc). I mounted an old Nitecore single Lithium battery flashlight onto the barrel with a NEBO Long Gun Light Mount. The price was right. So far, it has proven sturdy enough for it’s purpose and would grip a variety of diameters of lights. I can index my pointer finger on the barrel band, and my thumb falls perfectly on the tail switch of the light. If I were doing it super cheap, I’d use hose clamps (I had an AK set up like this for years). As long as you have a white light on your rifle, do whatever works. If you have a way to make holes in people, you should also be able to patch holes. Because I had real estate on the rifle, I decided to attach a (TK4) Tourniquet to the offside of the rifle stock. These TQ’s are great because they are so flat, are inexpensive, and can be applied one handed to yourself with a little practice. 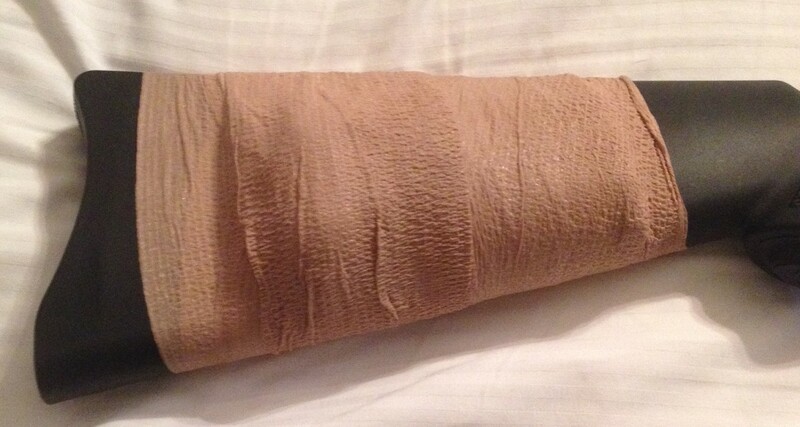 I wrapped Self-Adherent Bandage to secure it to the stock. This tape has held up pretty well for me when I have done this in the past. If it starts to fail, no big deal, I’ll replace it. Now we have on board medical in case we need to patch up a loved one. Like I’ve said before, get medical training if you haven’t. You’re more likely to save a life with that training than by saving the day in a mall shooting or whatever your super-hero gun fight looks like in your head. I’d like to get a snag free two point sling on the rifle. One that is out of the way, but can be used drap over the neck to get two hands free. I’m on the prowl for that. That’s it. Feel free to comment, share, and subscribe. Stay Safe and Protect the Brood! I’m a fairly pragmatic person. I’m an engineer by schooling and like to base my decisions on statistics, facts, research, personal experience, and sometimes a sprinkling of intuition. I’m no different when it comes to the self defense game. I’m going to write an ongoing series of posts about my decision to outfit a Ruger 10/22 for my wife for home defense. I’ll try to make my case about choosing this rifle by noting some case studies on actual defensive gun uses, terminal ballistics, ease of training with the rifle, advantages of the .22LR for a muzzle-blast sensitive shooter, financial reasons to choose .22LR, methodology for training my wife and family in it’s use, and I will document the ongoing process of developing a training program around this rifle. The Mission: Find and outfit a firearm for my wife which is reliable, chambered in an empirically effective caliber, will allow her to pass basic shooting standards, with which she can build competence and confidence to protect our family. Why not a ‘real’ caliber like 5.56mm, 12 gauge, or a 9mm pistol? Don’t get me wrong. My wife can shoot her Glock19 very well. She has taken a two day, 1000+ round Fighting Pistol class with Tactical Response, and plenty of follow up practice sessions, including a few with Claude Werner (The Tactical Professor). She shoots it well, but I think she would be the first to admit that shooting the 9mm isn’t a totally pleasant experience for her. I realize some of you are married to women who shoot .357mag in an airlite Smith for 150 rounds in a day and laugh about it. Well my wife can’t. In fact, in my experience, not many people can stand up to extended range sessions in any full-house caliber. She is good for maybe 25-50 rounds of practice before her flinch and trigger jerking starts to get the better of her. Many people, and women in particular, seem to be very sensitive to the over-pressure concussion of gun shots. 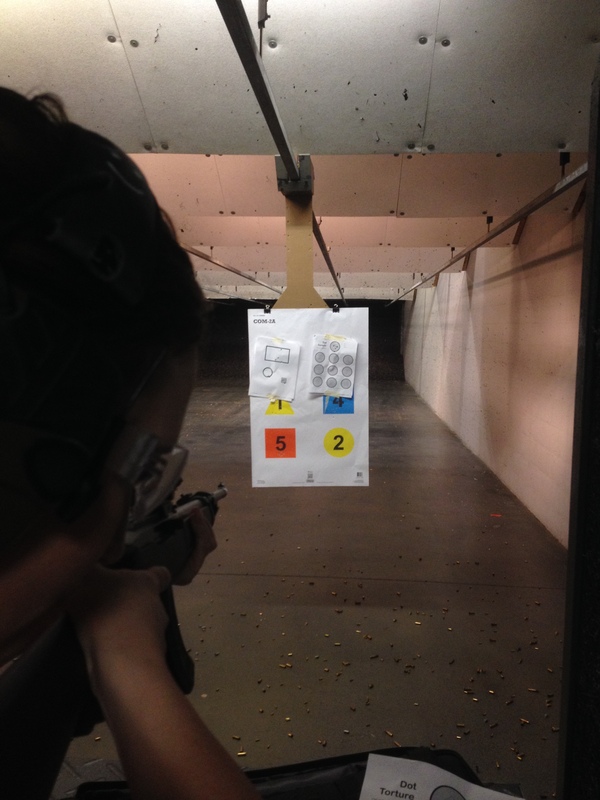 My wife is noticeably rattled after a short time in an indoor range. So what? So, she doesn’t want to practice, doesn’t want to go to the range, and doesn’t want to maintain what is absolutely a perishable skill. These are all bad things, especially with the chance that she’ll have to make a shot on the home invader while I’m actively fighting them. The need to make a ‘downrange friendly’ shot is a very real possibility. It is a more likely shot for average Joe Gunowner than the ‘hostage shot’ we see in all of the paper targets and cop movies. The fight between the two men broke the dining room table and chairs but, as they tussled, Miss Brown produced her pink gun from her bedside table. ‘I had my gun drawn, focused in on him – as he moved, my gun moved. I waited for my shot and when I saw an opening, I fired,’ she told the newspaper. I’ll admit that it’s a little selfish of me, but I want to give my wife every chance to make her shot if this situation arises. To do this, she needs to enjoy practice and be able to make these kinds of low probability shots cold and on demand. I decided that a Ruger 10/22 rifle could be a good choice based on the advice of my friends and mentors. Let’s talk further about why. Can the .22LR be effective against human targets? Some people will look at this data and say “He’s telling us all to carry .22s”. That’s not true. Although this study showed that the percentages of people stopped with one shot are similar between almost all handgun cartridges, there’s more to the story. Take a look at two numbers: the percentage of people who did not stop (no matter how many rounds were fired into them) and the one-shot-stop percentage. The lower caliber rounds (.22, .25, .32) had a failure rate that was roughly double that of the higher caliber rounds. The one-shot-stop percentage (where I considered all hits, anywhere on the body) trended generally higher as the round gets more powerful. So, we have to try to consider all aspects of Greg’s data. We can see that we have an approximate need for 1.4 rounds of .22LR before the attacker stops pressing the attack and a 34% chance of a fatality resulting from quality shot placement. The Ruger 10/22 factory 25 round magazines hold more than 1.4 rounds, so we’re looking good so far. Rifles, in general, are easier to shoot, hold more ammunition, and allow a greater degree of accuracy due to four points of contact with the body, instead of two with the pistol. With some training, we can improve our chances to make quality hits and affect the desired outcome (for the invader to leave us alone). We have to also be fair and acknowledge the fact that there is a higher probability of non-stops when using small calibers in defensive situations. Their lack of intermediate barrier penetration, their small permanent wound cavity, reliability issues, and all of the other issues with small and light projectiles need to be considered. I personally believe the statistic about failed stops is a shot placement issue and therefor can be trained to be improved (high center chest, ocular cavity hits being key). I don’t have any proof of this, so take that for what it’s worth. Our training needs to address putting a volley of rounds into these areas in a constrained time-frame, which we will talk about soon. Another issue might be the dedication level of the attackers. Against an opportunistic bad guy, it’s very probable that shooting won’t even be necessary (it often isn’t), just showing the intent and ability to use deadly force will make him remember he has somewhere better to be. Against a home invader, however, it’s possible that you’ll be facing a dedicated attacker who is after you. This is the sort of bad guy that you will have to shoot until you incapacitate them. You will have to make enough holes in the pump works or computer to shut down the attack. The .22LR can help you to this end by allowing rapid followup shots through minimal recoil, high capacity, and minimal muzzle flash. It can be a poor choice based on it’s lack of muzzle energy and occasional poor ignition. While Greg’s stats are a compilation of actual events (a whole lot of them, in fact) it’s still useful to read a few examples to illustrate some points. Let’s run through a few. “She was telling him not to hurt her, that she had money in the house. He then forced her into the bedroom where it’s believed he was going to sexually assault her with the threat of the knife. The victim was able to retrieve her .22 cal. pistol and responded to his deadly threat with deadly force and shot the suspect multiple times,” said Ritter. Ritter says the man fled out the back door and then he collapsed in the backyard. The suspect died at Gwinnett Medical Center. The notable issue here was the percentage of hits she achieved. As I recall it was 8/9 or 9/10 shots that found their mark. A very good hit ratio. She had done her practice. He was dead as she shot him, but he didn’t realize it until he made it out into the yard. The .22LR has several great benefits that allow one to become proficient, which we will talk about in a later installment. According to the release, Newman came to the home, threatened to kill Rich­ard Green and began punching him. After Newman placed him in a chokehold, Green’s 15-year-old son got a .22-caliber rifle and threatened to shoot if he didn’t release the hold, the statement said. When Newman didn’t let go, Green’s son fired once, striking Newman in the back, the statement said. I chose this situation to show that a young man (or even child with proper training) can wield a .22 and make a low probability shot with a friendly downrange. Stories like this made me consider long-guns over pistols. The homeowner says she feared for her life and pulled the trigger, but the gun misfired. The woman says she then pulled the trigger of the gun a second time and a shot was fired. That’s when she called 911, and held the intruder at gunpoint. She can be heard on the 911 tape telling the 26-year-old male suspect, “You better sit down! You better sit.” Then she asks 911 operators if they can hurry and get a police officer to help her. This one shows that an old woman can wield a .22 revolver and hold down the fort. It also shows the well known fact that rimfire ammo is prone to misfires. Which just stresses the importance of using high quality ammunition to ensure ignition when it matters. Here’s a cool interview Greg Ellifritz had with an older fellow about his use of the .22 revolvers for defense. Even though finding .22LR in stock in today’s market is like finding hen’s teeth, it still is an affordable caliber when you can find it. It can be had in very reliable loads. While these loadings are more expensive than the 550 round bricks, they are not prohibitively expensive. A reliable .22LR rifle will not break the bank. A new Ruger 10/22, for example, can be had for about $200. Add to this the required white light and mount, and possibly a red dot optic, and you’re into a budget home defense rifle for $300-$400. This allows inexpensive practice on an inexpensive rifle that is enjoyable to shoot, not abusive in recoil or noise, reliable with the right ammunition, light weight, and has proven effective in actual situations. So hopefully you’re following my train of thought on why the .22LR can be used for home defense. I hope I’ve given enough logical evidence to make my point. The next articles in this series will discuss how I’ve outfitted my wife’s rifle, the training program I’m developing with her, and her ongoing training. I want to thank Dr. Sherman of http://revolverscience.wordpress.com/ and Claude Werner of http://tacticalprofessor.wordpress.com/ for the inspiration to begin this project. Getting this project off the ground has been paying off tremendously in easing my mind when it comes to setting up a firearm for my wife and my mother to use in the event of an emergency if they’re home alone, or in the event that something happens to me during a home invasion and they are the last line of defense between the bad guys and my son.